Legate Quentin Cipius, an Imperial soldier, is an Officer in the Imperial Legion. There are two ways of encountering Quentin Cipius, depending on whether you joined forces with the Legion or the Stormcloaks. Quentin wears Imperial armor with matching boots and bracers. He wields an imperial sword and a steel dagger and carries an imperial bow for long-distance attacks. He carries a number of steel arrows and his sleep outfit, a belted tunic. 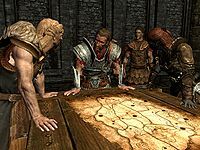 If you joined the Stormcloaks and completed their side of Battle for Whiterun, a Whiterun Imperial Camp will be set up east of Rorikstead and Quentin will be the commander of the camp. At this point, you are considered a member of the Stormcloaks and Quentin Cipius will immediately ask you to leave. If you stick around for too long, Quentin and his men will draw weapons and attack. This hostile behavior will continue, even after the Liberation of Skyrim is completed. If you joined the Legion, Quentin Cipius will initially appear in Dragonsreach during the final stages of Message to Whiterun. 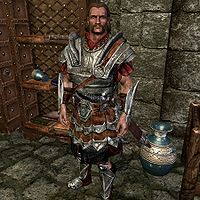 Quentin will be the Legate overseeing the Imperial soldiers sent to Whiterun to help battle the besieging Stormcloaks. He will spend all of his time discussing strategy with Balgruuf the Greater and will not participate directly in the Battle for Whiterun. 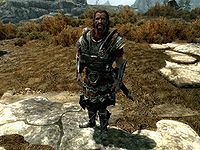 He will stay in Dragonsreach indefinitely, even after Reunification of Skyrim is finished and Ulfric Stormcloak is dead. "The men will be fighting in flames." Imperial Soldier: "Sir! I... I have..."
Quentin: "Take a moment to breathe, soldier." Balgruuf: "The outer walls are strong. If we can hold them there..."
Balgruuf: "Damnit. Where'd they get catapults? The city walls are already falling apart as it is." Quentin: "My scouts tell me they're loading them with fire." Balgruuf: "So, he wants to take my city, walls intact." Quentin: "The men will be fighting in flames." Balgruuf: "My men are fearless. It's the Imperial milk drinkers I'm worried about." Quentin: "If you prefer I took my men and left..."
Balgruuf: "No. Of course not. Just - don't let me down Cipius. We'll need to set up water brigades to combat the flames." Quentin: "Already taken care of." Balgruuf: "You Imperials are efficient, I'll give you that. How long until they arrive?" Quentin: "Not long. They're hiding in the country side." Balgruuf: "Damnit. What's he waiting for?" Imperial Soldier: "Sir, they're on the move. They'll be at the gates at any moment!" Quentin: "Why didn't you say so immediately?!" Imperial Soldier: "Sir, I tried." Balgruuf: "This is it! Time to see what these Stormcloaks are made of." Quentin: "The men are already gathering at the gates. Move it soldier. Spread the word. Go. Go. Go." Balgruuf: "Oblivion take them. Every miserable last one of them." At the very beginning of the game, Quentin Cipius spawns where the Whiterun Imperial Camp is supposed to be, standing in the wilderness, straight north of Gjukar's Monument. If you join the Stormcloaks and take over Whiterun, the camp will be set up and Quentin will find a purpose in the wilderness. If you side with the Imperials and defend Whiterun, Quentin will show up in Dragonsreach and the camp will never be built. Oddly, a duplicate of Quentin will still exist in the wilderness, even if Quentin is in Dragonsreach.